Krithia: "Ours is Just to Do and Die"
Krithia was a Greek village on the tip of the Gallipoli peninsula, approximately eight kilometres north of Cape Helles, the site of the costly British landings of 25 April 1915. The village was at the foot of the dominating heights of Achi Baba peak which had been the first objective of the British troops on 25 April. The British 29th Division, in the First Battle of Krithia, advanced the line to within three kilometres of the village. The Australian 2nd Brigade and the New Zealand Brigade were transferred from Anzac Cove to Helles to assist the British and French in the second Battle of Krithia from 6 to 8 May. British attacks on 6 May gained some ground but two further attacks next day failed to make progress. A further British attempt failed on 8 May and just before 5 pm that afternoon, the 2nd Brigade, commanded by Colonel James M’Cay, was given orders to attack at 5.30 pm when it was still light. 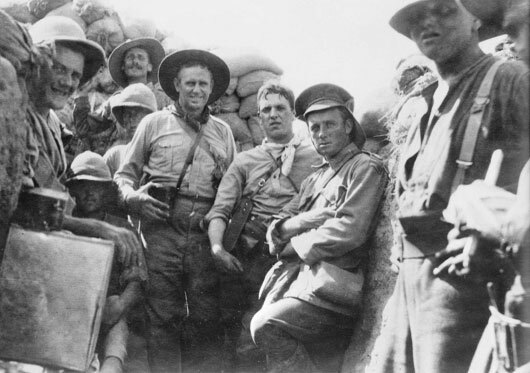 The Australians advanced from a trench manned by Indian soldiers and 500 metres further on unexpectedly found another trench manned by British soldiers. This trench was named by the Australians as ‘The Tommies Trench’ and the Australians either jumped into it or laid down behind it. Three minutes later, M’Cay with more Australians approached and M'Cay called on the men taking shelter to continue the advance. The Australians pressed forward under heavy enemy fire before casualties compelled them to stop 400 metres from the Turkish trenches and two kilometres from Krithia. The Australians in an hour had suffered 1000 killed and wounded. On the left, the New Zealanders gained a little ground but at a heavy cost. With the Turks digging in and receiving reinforcements, the two brigades returned to Anzac Cove. 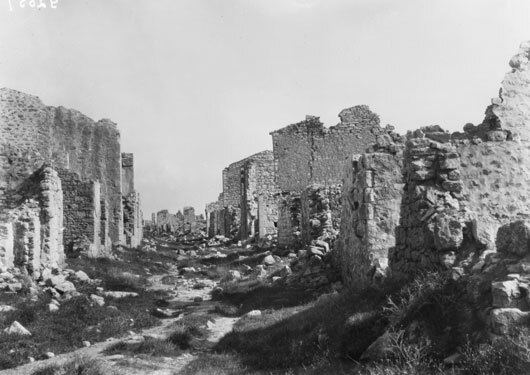 The ruins of the main street in Krithia, Cape Helles (AWM G02057). 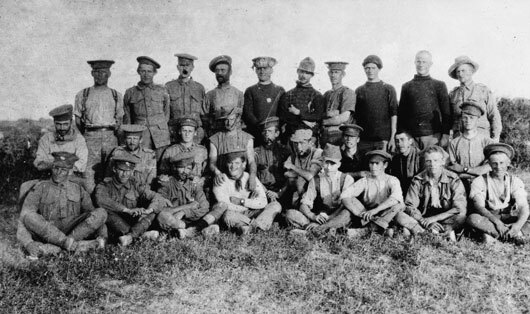 A group portait of the surviving members of D Company, 7th Battalion, after the Battle of Krithia (AWM A03308). 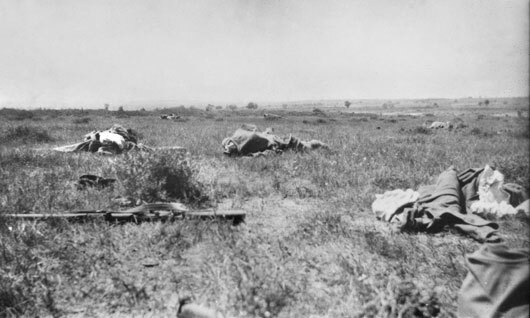 The dismal scene after an attack by the 2nd Infantry Brigade at Krithia (AWM C01079). A group of unidentified gunners in a trench on the Gallipoli Peninsula (AWM C01177). 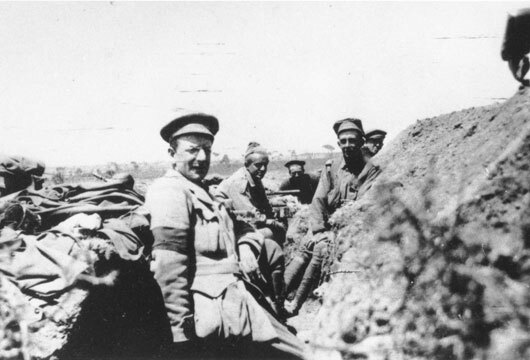 Lester Lawrence, English war correspondent for Reuters, in a trench at Helles (AWM A05394).